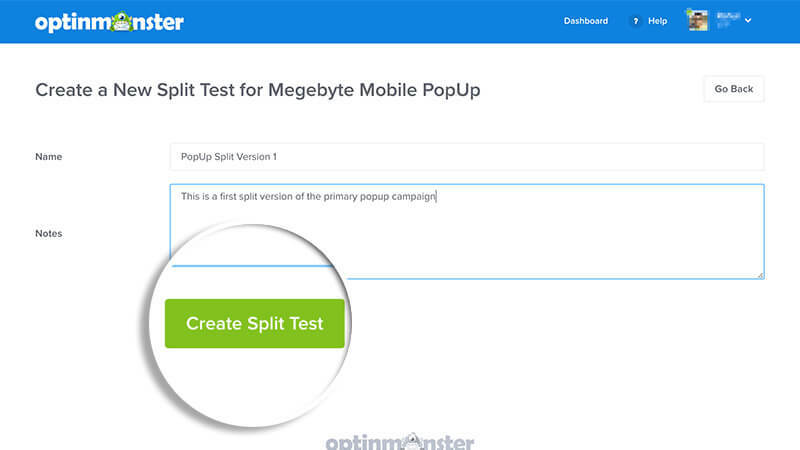 Creating a split test in OptinMonster is a whole new experience in the latest version of OptinMonster! While the essence of split testing remains the same, the capabilities of running split tests have increased exponentially. This guide will walk you through how to implement split tests in OptinMonster. If you are thinking about creating a split test, it is assumed that you have already created your first campaign. How do I enable/disable split test child campaigns? How does OptinMonster run split tests? How do I change the Primary campaign? Can I change my split test notes later? Do you have any split testing tips or tricks I can follow? REQUIREMENTS: Split testing requires a Plus subscription. The first step in creating a split test is to choose the campaign you want to split test. From the OptinMonster Dashboard select the More Options button. Next, select the A/B Split Test option within the dropdown list. On the next screen you’ll be required to add a Title, and optionally Notes for your new split test. We recommend giving your split test a few notes for easier identification later on. Finally, select the Create Split Test button. 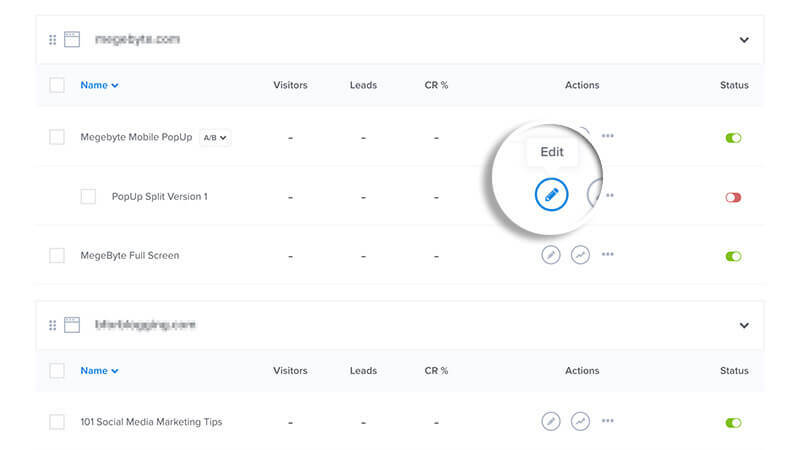 Once you’ve created a new split test, you’ll want to modify one specific element that you can compare against the original campaign. 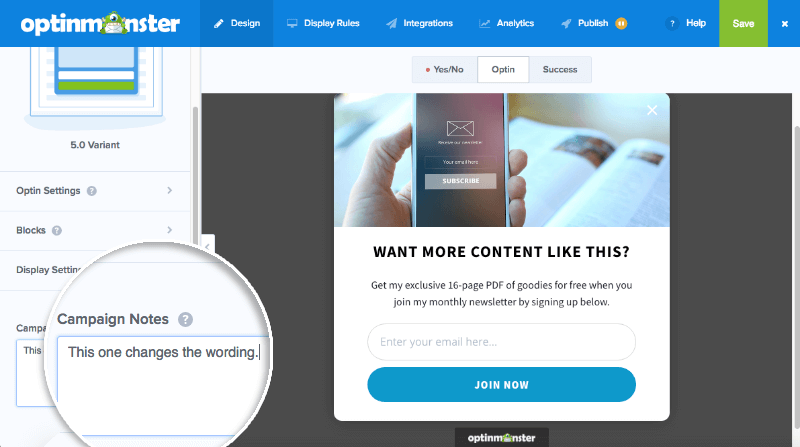 For example, you may want to change the title text used in your split test campaign, or change the color of the submit button to see if that one specific change produces better conversion results. 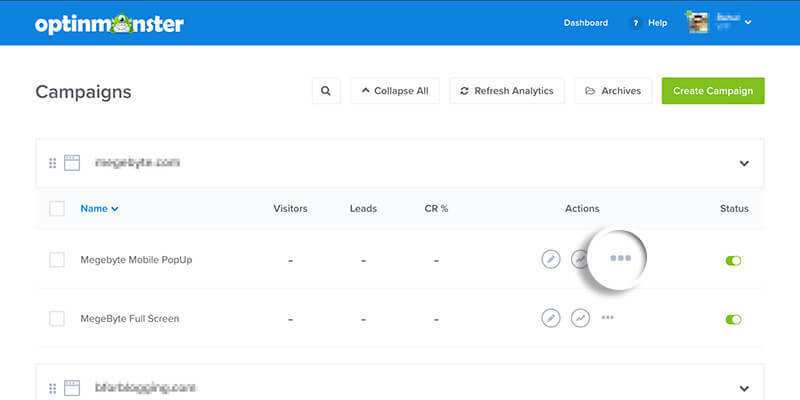 We recommend making only a single change between each split test campaign so you can accurately determine which modification returns better conversions. The more changes you make between campaigns the less reliable your split testing becomes. 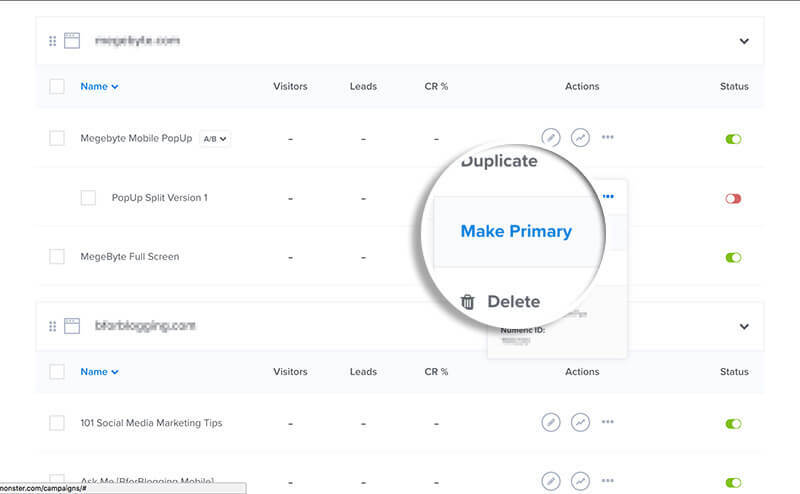 Wondering the best way to split test your campaigns? Check out this article for tips on how to make effective split tests! Q: How do I enable/disable split test child campaigns? A: You can easily enable/disable split test child campaigns from the OptinMonster Dashboard. First select the A/B button next to the Primary campaign’s title, then toggle the active/inactive button for the child campaign you want to enable/disable. If you make the Primary campaign inactive while continuing to run any child campaign(s) in the split test group, none of the campaigns will load. Q: How does OptinMonster run split tests? A: To explain by example, imagine you have only one campaign, titled Campaign A. Then you decide to create three split tests: (1) Campaign A-1, (2) Campaign A-2, and (3) Campaign A-3. You now have 4 variations of 1 kind of campaign, the original and the 3 tests. Campaign A is active, and only some split tests are enabled. In this scenario, OptinMonster will randomly assign either Campaign A or one of the split tests. If the split test it chooses is one that is currently disabled, then OptinMonster will load Campaign A. Campaign A is inactive, and only some split tests are enabled. In this scenario, OptinMonster will not load any campaign for that pageview. Q: How do I change the Primary campaign? A: You may wish to change the Primary campaign in a split test group if you’ve determined one split test campaign converts better than the other(s) and want to show only that campaign to all visitors on your site. From the Dashboard, select the More Options button next to the split test you want to make Primary, then select the Make Primary option from the dropdown options. You’ll now see the split test is the new Primary campaign and the previous Primary campaign is now a split test. IMPORTANT: If you are using the campaign specific embed code on your site, rather than the sitewide embed code: when changing the primary campaign for a split test, you must update the embed code on your website to use the new primary campaign’s campaign specific embed code. If the primary campaign is changed and you do not also change the campaign specific embed code used on your site, no campaigns in the split test will appear. If you are using the sitewide embed code, no changes are necessary after changing the primary campaign of a split test. Q: Can I change my split test notes later? A: Yes, that’s easy! From the Dashboard, select the Edit button for the split test you wish to edit. Next, under the OptinMonster Builder’s Design tab, you will see a textarea labelled Campaign Notes where you can add any special notes about this specific split-test variant. Update your notes, then click Save. Q: Do you have any split testing tips or tricks I can follow? First, make sure you understand the difference between A/B split testing and multivariate testing. A/B testing only tests one variable at a time. Multivariate testing allows you to test multiple conditions at once. Learn more about the difference between A/B testing and multivariate testing. 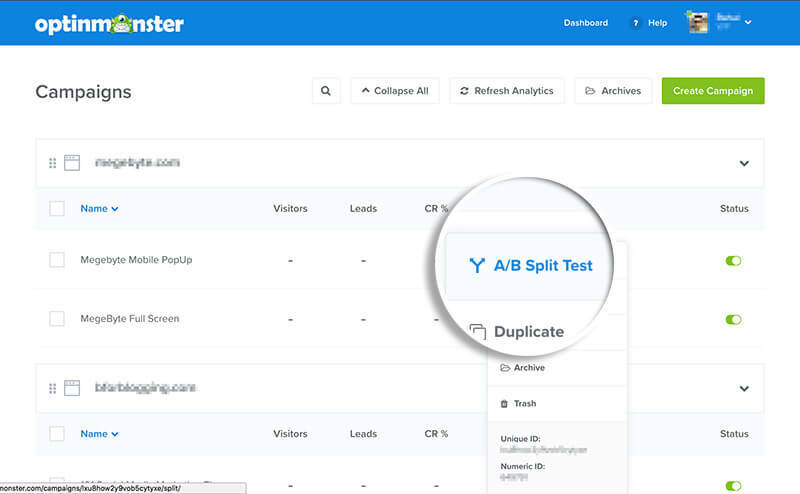 Then, check out some of the great split testing articles we’ve published to learn more about leveraging the power of OptinMonster’s split testing tool.